IN THE 21ST CENTURY, THE UNITED STATES OF AMERICA UNVEILED A NEW SYSTEM OF SATELLITES AND POWERFUL LASERS THAT PROVIDED NOT ONLY A FLAWLESS DEFENSE AGAINST INTERCONTINENTAL MISSILE ATTACK, BUT ALSO A MEANS TO DESTROY ENEMY FORCES ANYWHERE ON THE GLOBE WITH PINPOINT ACCURACY. OTHER NATIONS OF THE WORLD PROTESTED THIS UPSET IN BALANCE OF POWER, DESPITE THE UNITED STATES’ CLAIMS THAT THE LASERS WERE FOR DEFENSIVE PURPOSES ONLY. IF THE UNITED STATES POSSESSED THE POWER TO UNLEASH INSTANT DESTRUCTION ANYWHERE AT A WHIM, THE WORLD WAS AT THEIR MERCY. A GLOBAL SUMMIT WAS HELD, BUT ALL ATTEMPTS TO PERSUADE THE UNITED STATES TO DISMANTLE ITS LASER SYSTEM FAILED. PROTEST GAVE WAY TO FEAR, THEN TO DECISIVE ACTION. NO SINGLE COUNTRY HAD THE MILITARY STRENGTH TO OPPOSE THE UNITED STATES, SO AN UNPRECEDENTED COALITION OF GOVERNMENTS WAS FORMED INTENT ON NEUTRALIZING THE NASCENT LASER SYSTEM. BELIEVING THAT THE UNITED STATES MIGHT BE LESS DISPOSED TO USE THEIR LASERS ON THEIR OWN SOIL, IT WAS DETERMINED THAT A SIMULTANEOUS INVASION OF NORTH AMERICA FROM THREE DIRECTIONS HAD THE BEST CHANCE FOR SUCCESS; THE ASIAN’S PEOPLE’S REPUBLIC WOULD ATTACK FROM THE WEST, THE CENTRAL AMERICAN FEDERATION FROM THE SOUTH, AND THE EURO- SOCIALIST PACT FROM THE EAST. 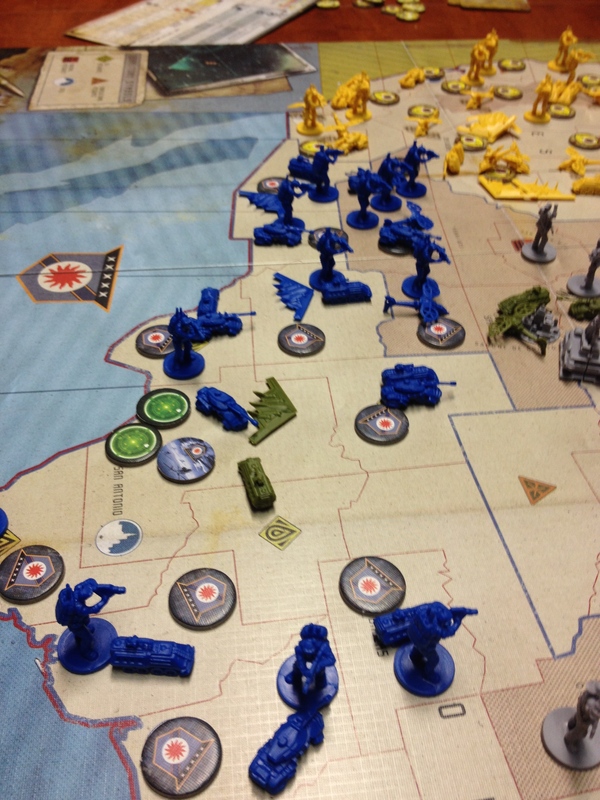 THE INVADERS HOPE TO STRIKE QUICKLY ENOUGH TO ACHIEVE THEIR GOAL BEFORE SUFFERING TOO MANY LOSSES. EVERY ARMY DREADS FIGHTING A WAR ON TWO FRONTS – THE UNITED STATES IS ABOUT TO FACE THREE. 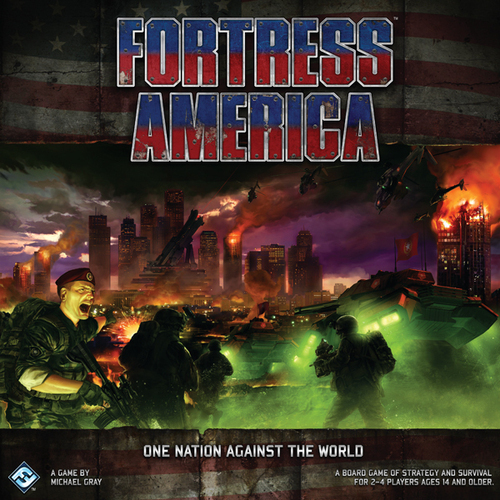 WILL FORTRESS AMERICA SURVIVE? The Asian People’s Alliance consolidates control over the West coast. In the West, the Asian People’s Alliance rapidly seized control of the coast—although their position would be challenged from time to time by small bands of brave American partisans. In the south, the Central American Federation poured across the Rio Grande. Its forces soon secured most of Texas, Arizona, and New Mexico, and—despite a heroic US counter-attack in San Antonio—soon began to push onwards into southern Utah and Colorado. Immigration reform had arrived! Texas falls to the Central American Federation. In the east, the Euro-Socialist Pact stormed ashore extolling the virtues of a national healthcare system. Washington DC soon fell, and the attackers pressed on in an attempt to seize control of Philadelphia and New York too. Fighting was heavy in the Appalachian Mountains, as American troops tried to prevent the enemy from breaking out into the southern and midwest states. US reinforcements desperately try to halt the Euro-Socialist invaders. A daring strike by Euro-Socialist special forces seized control of Atlanta airport, creating an air bridgehead. 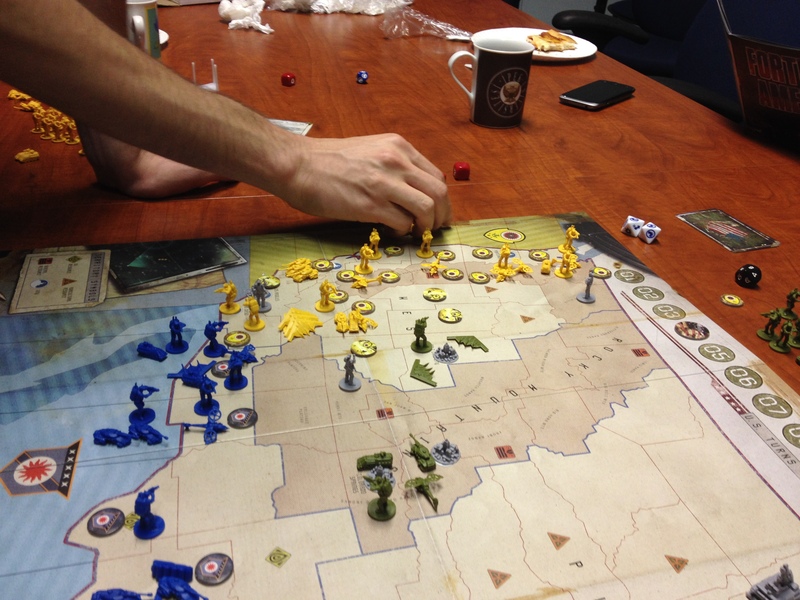 The attackers poured additional reinforcements into the fray. As more and more of the US satellite laser system became operational, it began to inflict heavy damage on the invaders. In Washington DC, a partisan uprising liberated the capital from its occupiers. However, it was too little, too late. With much of the country now under the control of the tripartite alliance, the President decided that further resistance was futile. America surrendered—and, by the narrowest of margins (96-96-97), the Euro-Socialist Alliance emerged as the world’s leading power.